You've heard the saying "pick somebody's brain" . . .
now it's your turn to do it. Step #1: Remove the leaves from the cauliflower and carefully cut out most of the stem, leaving the outside intact. This will create a hollow area in the middle. Use toothpicks to help hold the outside together if you need to. Step #2: Using a toothpick or a tiny paint brush dipped in the salsa, "draw" veins by following some of the natural lines in the cauliflower. Step #3: Pour salsa into a shallow bowl or pan until the bowl is nearly full. 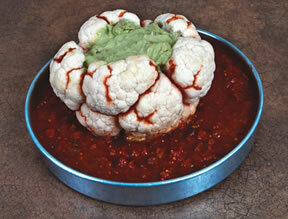 Step #4: Set the cauliflower in the middle of the salsa with the hollow side facing up. Step #5: Fill the hollowed-out area of the cauliflower with the guacamole dip. Step #6: Serve with chips. It'll tease your taste buds.